PREVIOUS:WGNO Anchor Heads to Fox 5 D.C.
Forecasting serious winter weather is apparently now a serious crime in Iowa. 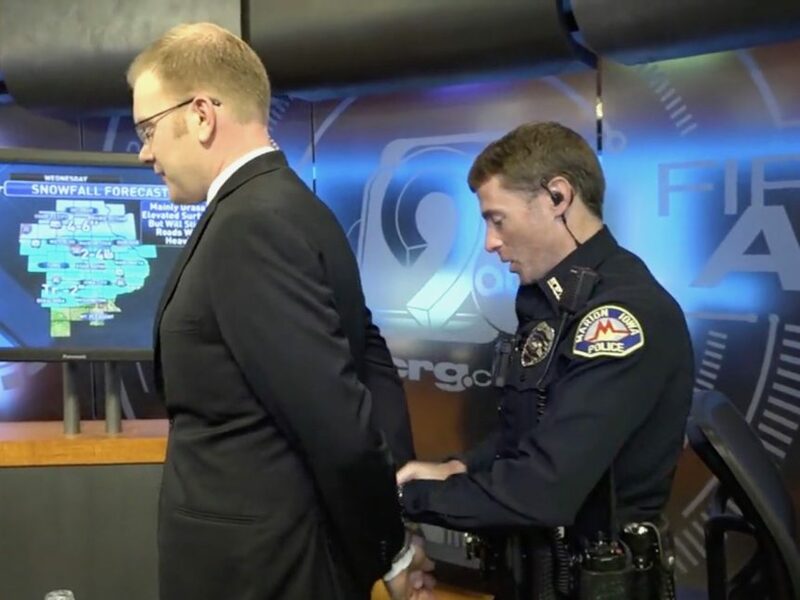 Any offenders could be arrested at any time, and this morning KCRG meteorologist Kaj O’Mara got cuffed. “We have people complaining they have been promised spring. We have baseball games that have been postponed, we have people that want to walk their dogs without a parka,” said Tom Dobbs, an officer with the Marion Police Department. The station agreed and decided to take action. “The viewers have spoken. They are tired of this weather. You promised them spring, you have not carried through with that. You are being arrested on this warrant,” said Officer Dobbs as he handcuffed O’Mara in the weather center. The officer named deception and false predictions among other charges in the warrant. This comes as O’Mara predicted another few inches of snow to fall in the Marion area later this week. You can watch the entire arrest—we mean prank—below.